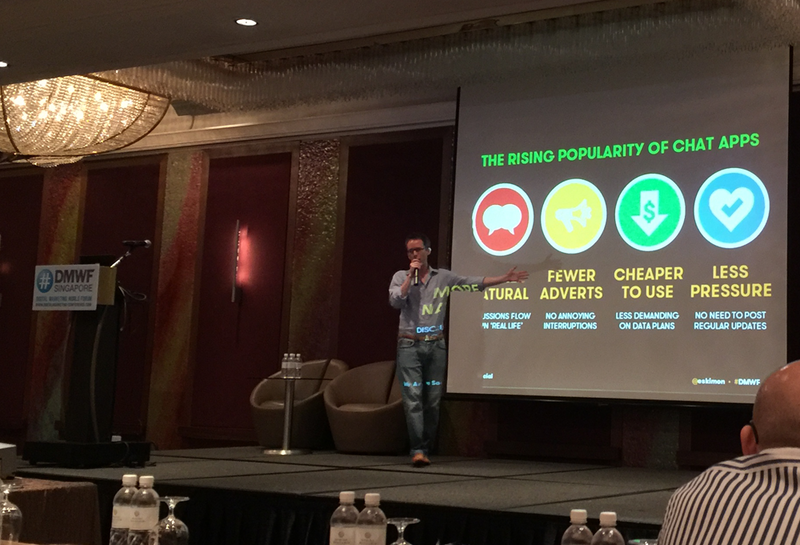 The Digital Marketing World Forum in Singapore turned out to be quite entertaining and informative. If anything, that’s proof of the importance of having a good host. With Simon Kemp of We Are Social and Kepios fame, the organisation had an entertaining and knowledgeable person leading the conference. He also delivered an excellent job as moderator of a workshop on crisis communication management. 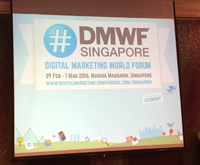 Here are some of the highlights of the DMWF. Simon had a few interesting statistics from the annual social media data deck that We Are Social produces every year. The most interesting was one about the surge of chat applications. The stat simply shows that Facebook will be overtaken by a chat app in the next 18 months in terms of number of users. This has direct implications for the advertising business model because most chat apps, with the exception of WeChat, do not allow advertising. Without exception the speakers pointed out that social media is now the most important topic on the agenda of digital marketers. Social listening is gaining traction. Working with the data and feedback coming from these tools is a challenge for many organisations today. Ferrero claims to have a widget in development that will allow all employees to monitor social media communication that is related to Ferrero from their desktops. Kenrick Drijkoningen from HomeAway Asia stated in a panel discussion that social is actually best used for customer service. Simon Kemp frequently runs workshops that let participants experience how tricky it is to deal with a crisis emerging from social media, e.g. a tweet-storm. So at DMWF he had 6 groups in a room working frantically for 30 minutes on a plan to deal with a few crisis-examples based on real life crisis moments. Next to social is the enduring topic of content-marketing. Not only social channels but marketing in general needs to be based on story telling. Key challenge here is to develop good content that is delivered in context and that enhances the brand engagement. This was also one of the first conferences in recent weeks where we witnessed a discussion about attribution. By turning marketing planning into an iterative process that checks the success of multiple short campaigns, marketers can adopt campaigns on-the-go. Some brands, like Marriott have addressed this by setting up digital marketing command centres, according to Jhorna Rincon. At the same time she explained how the hospitality business struggles to get ahead because of all the legacy systems they have in place, which do not offer the integration capabilities that modern marketing platforms have built in from the ground up. Attribution based planning is important because the marketing environment has become so much more dynamic, that long term planning has become an almost futile in-efficient process. But attribution also requires access to good data, and both data access and analytics are still bottlenecks. Data is often incomplete and in the case of Google Analytics very much focused on the last click, without providing enough insights as to how a customer got to click with an omni-channel perspective. Allan Vincentz from Norbreeze Group explained why he as tired of programmatic and RTB. Against the background of data use and personalisation he claimed that programmatic should be seen as being of marketing automation. It all comes down to using data and permission effectively to do personalised pull and push messaging. Yet, there is no easy and clear way forward as we are still playing catch up in the Data Management Platform (DMP) space. Another remark, coming from Dominic Koh, head of digital marketing at Mastercard, explained more about how companies can deal with change. He said that they overcame resistance and were more successful in implementing new digital marketing tactics by training people. He said that this was possible because of support from the senior management, something that seems to invariably apply in digital marketing. It is an area that is so much in flux according to the speakers, that most face real challenges in the area of change management and adoption. But with the customer embracing technology and taking control, digital marketing needs to be at the centre of any business strategy. As Sanchit Sanga from Mindshare concisely put it, one should do marketing in a digital world not just digital marketing. It was not all ‘new’ and exciting at the DMWF. Maybe there are too many conferences and marketers simply don’t have enough time to update their material between them. A few appeared on stage with campaigns and cases that we have seen two years ago and last year again. We won’t mention any names but you know who you are, Rahul. We are looking forward to next year’s DMWF. Provided they have a good host again and some speakers update their decks, it turned out to be a compact and focused event, worthwhile spending time with. 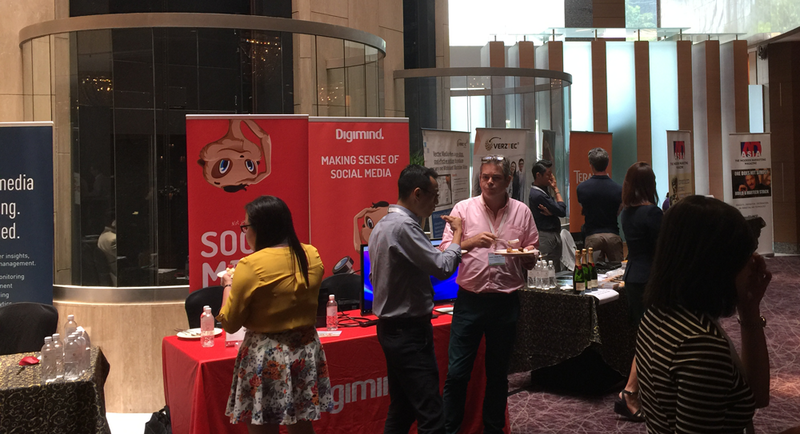 The DMWF sponsor area with the Digimind booth.